It is OFFICIALLY autumn, and we’re kicking things off in style over here on the TomatoInk Blog because autumn is the time to pumpkin all the things! As you all know, I have an inconsolable sweet tooth, but I’m getting a little tired of pumpkins either being used for a sweet pie (delicious but totally predictable) or even soup (also delicious, mind you, albeit a little boring). Pumpkins are so versatile that they taste amazing no matter how you serve them (although you may want to avoid serving them raw), so I figured I’d dedicate this post to all the savory pumpkin recipes out there. I was really pleased to find so many pumpkin-laced pasta dishes out there. This amazing pumpkin maple macaroni and cheese ticks all the boxes as far as I’m concerned. I mean, it’s pumpkin and maple and mac and cheese. You could try this creamy pumpkin baked rigatoni, which is comfort food at its finest, and also tagged kid-friendly by the blogger. This hearty-looking pumpkin-sage baked ziti — with that crusty melted cheese topping — looks like it could be a really easy week night dinner because it takes only ten minutes to prepare, and around forty minutes to cook. If you’ve got the time — and you’re feeling adventurous — you can make this gorgeous pumpkin-ricotta ravioli with brown butter walnut sauce! If you’re craving spaghetti, though, you can’t go wrong with this pumpkin crème fraiche spaghetti with fried onions and sage leaves. Meanwhile, if you’ve got some kale sitting around, you could use it in this pumpkin and kale pasta bake recipe! Pumpkins aren’t an ingredient that is solely associated with dinners either; you could easily put pumpkin in a sandwich, or on grilled cheese, like this glorious-sounding pumpkin cheddar grilled cheese. You could also make baked pumpkin falafel bowls with maple tahini dressing; bonus: you could use the leftover pumpkin falafels in a sandwich the next day. Know what else would be good in a sandwich the next day? These spicy honey-roasted pumpkin wedges. They’d be good wrapped up in rotis or parathas or any other flatbread of your choice too. Use your imagination and add salad and cheese as you prefer. Speaking of salad, do your lunches primarily consist of salads too? If so, you will love this nourishing roasted pumpkin and peach salad. Pumpkins make great snacks as well. I’d love to have a bowl of this in my hands on a cold autumn night, tucked up under a blanket in front of the telly. Wouldn’t you? A mountain of this would work pretty well too; just add a refreshing beverage of your choice. Or how about a stack of these savory pumpkin-cheddar pancakes with rosemary? Who says pancakes are for breakfast only? Or you could opt for these savory pumpkin pancakes as well. Of course, nothing screams snacks like pretzels do, and thankfully, this recipe for soft pumpkin pretzels has you covered. If you’re anything like me, pizzas are as much a snack as they are a main meal, but hang on. There’s no need to order one in when you can just make this pumpkin pizza with crispy sage or this savory pumpkin pizza. Now I know I sort of dismissed pumpkin soup above as a tad boring (albeit delicious! 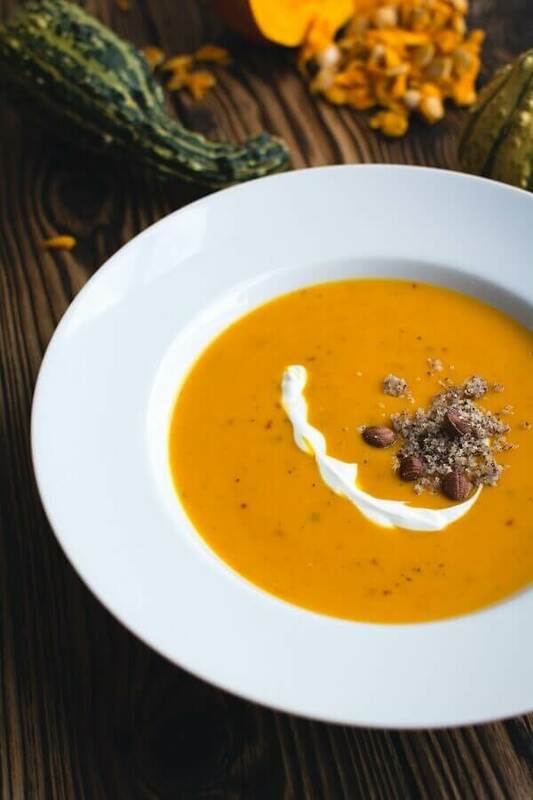 ), but there are so many wonderful pumpkin soup variations out there that it would be remiss of me to not mention them in a post about savory pumpkin recipes. I adore soup; it’s comforting, it’s warming, and it’s a meal that reminds me of home. I like to make my own croutons and toss them in because soup isn’t soup without croutons, in my opinion. I’m dying to try this pumpkin ale beer cheese soup with sharp cheddar and gruyere because it sounds like it’s just up my alley, although I wouldn’t say no to this hearty roasted pumpkin soup with mushrooms and chives or this pumpkin chowder. If you love dunking bread into your soup, you can’t go wrong with this pumpkin bread recipe; pumpkin bread dunked in pumpkin soup sounds like a winning sensory experience to me. When it comes to pies, everyone seems to prefer the sweet variety. But how about a savory one? Even better, how about a pot pie version? This delicious-sounding cheesy pumpkin lentil pot pie is the perfect fall dinner. Easy to make, but still a bit special. For those nights when you have a little more time, you could try this pumpkin, basil, goat’s cheese, and fig tart. Bonus: it’s gluten free! Or try these brown butter pumpkin grits that are bound to be amazing because brown butter and pumpkin sound like a marriage made in heaven. Happy autumn! Enjoy this beautiful season, and have many memorable pumpkin-based meals! Awanthi Vardaraj lives and writes in the port city of Chennai, in the south of India, where she runs her own small artisanal bakery and keeps a garden full of jasmine plants and herbs that she still cannot name. As a freelance writer, she mostly focuses on food, feminism, travel, mental health, and poverty. She also nurtures a deep love for the Oxford comma and the semicolon. Visit her website at www.awanthi.com and follow her on Twitter at AwanthiVardaraj. Which pumpkin dishes are your favorite? Share your savory pumpkin recipes below or on Facebook and Twitter.